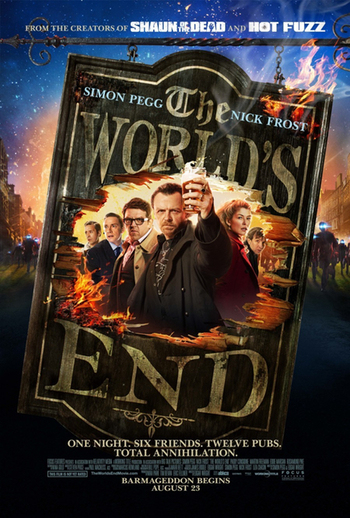 The World’s End is the last film in Edgar Wright, Nira Park, Simon Pegg and Nick Frost’s Three Flavours Cornetto trilogy, the earlier films being Shaun of the Dead and Hot Fuzz. Like its predecessors, it’s a genre parody – this time, of middle-class English alien invasion stories in the vein of John Wyndham novels and the Quatermass franchise. This article is going to be mostly a reaction to the most spoileriffic parts of the film, so I’ll start with a quick mini-review for folks who don’t want spoilers and then leave a spoiler space before saying what I really want to say about it. The World’s End opens with a narration by Simon Pegg’s character, Gary King, telling the tale of a legendary pub crawl he and his friends Steven Prince (Paddy Considine), Oliver Chamberlain (Martin Freeman), Peter Page (Eddie Marsan), and Andrew Knightley (Nick Frost) embarked on way back in 1990 after their last day at school. King was the hyper-cool (in a very gothic Sisters of Mercy-worshipping sort of way) leader of the gang, and he’d convinced the others to attempt the Golden Mile: a pub crawl wending its way through all 12 pubs in their small country home town of Newton Haven, the last pub of which was, naturally, the legendary World’s End. Drama, drunkenness, and toking of weed ensued, and in the end they had to pack it in having only visited 9 of the pubs, so despite having a mostly successful night (by King’s reckoning) they never actually got to The World’s End. 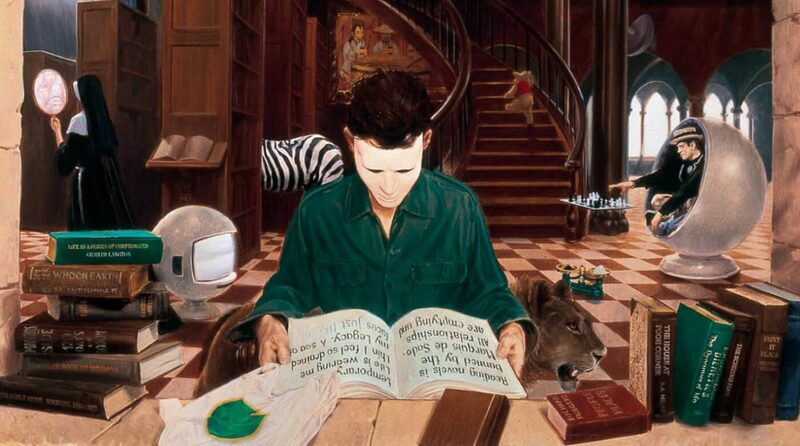 Now it’s over two decades later, and all of a sudden King shows up back in his friends’ lives, cajoling, persuading, bribing and emotionally blackmailing them into attempting the Golden Mile one more time. Whilst all the other pals have clearly moved on in life – and Andy, in particular, wants no more to do with King due to a traumatic bust-up at some point in the intervening years – King clearly hasn’t, to the point where he still wears the same clothes. Out of a mixture of obligation, nostalgia, and pity, the friends agree to accompany King on this fool’s errand. Then they discover that something very strange has happened to Newton Haven since they all moved to London, and all hell breaks loose. The big thing I would say to anyone going in to see the film is that you shouldn’t expect a laugh riot on the level of the previous two movies. The Cornetto films have always been genre hybrids – comedy-horror, comedy-action, and now comedy-SF-drama – but this time around the comedy side is leaned on much less heavily. That’s not to say that there isn’t a laugh or two, but you should also be ready for some depressing bits. On top of that, for reasons I will explain in the full analysis below, I think it is less satisfying as a standalone movie than the other two films. In particular, towards the end the film relies a lot on a couple of big and surprisingly inelegant info-dumps, which makes me suspect that there may have been problems with the script, and whilst the previous two movies quite adeptly wrapped up their stories with their epilogue, I felt The World’s End left some important stuff unexplored.